The 2018 shortlist recognizes four books that demonstrate excellence and reflect Vancouver’s unique character, rich diversity and culture, history and residents. Favouring connection over isolation, and healing over harm, the finalist authors explore the impermanence of memory, people, places, and spaces in Vancouver’s second century. 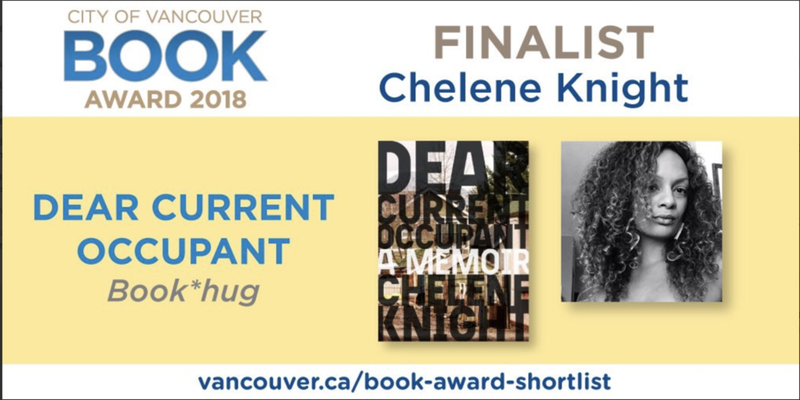 Chelene Knight’s honest and powerful memoire of a childhood in East Vancouver genre-busts its way to deeper understanding of memory and of belonging. Growing up precariously-housed in 20 different homes, the author pens letters to their current occupants and so deconstructs her past and re-defines what it means to be home. I can’t pee by myself. My father once told me to become a parent meant giving up any selfish part of you. When I was younger, I didn’t know if I wanted kids. I felt too self-absorbed and spoiled, and never ready. I’m not sure anyone ever feels truly ready, but I eventually felt ready enough. Now I often think about my father’s words as I struggle to find balance between fulfilling my kids’ needs, and maintaining my own. While I was never sure about becoming a mother, I always wanted to be a writer. In high school, I took all three OAC English credits, even though I only needed one to graduate. I won a school award for a poem I wrote. I explored university options based on their English programs. But I was never actively encouraged, by a teacher or mentor, to pursue this path. And I was too timid and quiet and uncertain to encourage myself. I was actively discouraged by my Greek immigrant parents. “It’s not practical,” according to my father. Writing isn’t a profession or career, words that caused my skin to prickle every time he said them. My parents were strongly vocal about the path they wanted for my life, so much so that I thought I wanted it, too. My first year at university, I studied (and failed) Economics and French. I graduated with an Arts and Science degree, and spent years moving from job to job, not writing, seeking a profession I wouldn’t choke on, something that would lead to a good life. A life that was worthy of my parents moving to Canada for. I applied (and failed - three times) to graduate school as a mature student; after years of schooling at the graduate level, work experience under supervision, and studying for three registration exams, I finally became a professional. Now at 41, I’m considered late to both motherhood and writing. Part of the postponement was because my 20s and 30s were punctuated with bouts of depression that would leave me collapsed, shackled and gasping. Both decades were strung together by a line of fear and anxiety that I’m not good enough, not good enough, not good enough. On the days I couldn’t move, I managed to keep breathing. By my late 30s, after settling into my career, finding a good therapist, and learning to tame and temper my mental health so it wouldn’t leave me reeling, I had my first daughter, and I started to focus more seriously on writing. I now carry with me a strength, maturity and confidence my younger self most definitely lacked. I make a different mother, and writer, than I would have at 31, or 21. A better one, a stronger one. Writing is solitary. You wrap up the thoughts and ideas from inside your head into random groupings of letters; you take these words and unfurl them onto a page. Most of the work is in re-writing, re-organizing, re-wording, revising. It’s hard, time-consuming, and can be lonely. In the chaos of motherhood, there is little to no time for yourself. Especially in the early days with a newborn, especially with two kids. The baby cycles through sleeping and feeding sessions, with diaper changes thrown in. There is no schedule. The toddler has a schedule but is learning to adjust to the new family dynamics. No one gets much sleep. Someone is usually crying. Sometimes it’s me. I use these moments to think, to come up with words, to string sentences together. I no longer have the luxury of chunks of time. While I prefer pen and paper, it’s hard (impossible?) to physically write while holding a baby, let alone bouncing, or walking, or rocking one. Thank goodness for technology; the notes app on my phone is bursting with snippets of ideas, sentence fragments, and paragraph drafts that I cobble together in these moments. Usually one-handed. Often with my left. Sometimes in the dark, amidst sighs and squeaks and murmurs from the baby. Thank goodness for the autocorrect and predictive text functions. It’s messy and scattered, my writing process. Fragmented. One that is slowed. Down. I ruminate and edit in my head for much longer before I get things onto paper. I spend less time worrying about precise wording. I’ve adapted, because I needed to. There is no real prescription for how to write. Some people wake at 5 a.m. daily to get an hour of work in before the day starts. Some people go to a cafe every Sunday afternoon. The only consensus, I think, is to write. Turn ideas into words and get them out on the page, on whatever schedule works for you. Do the work. One of the biggest lessons I learned while on mat leave with my first daughter is that everything is a stage. This time of my life will pass. This mat leave will end and I will go back to my career; my daughters will grow, their needs will change, their independence will expand, and I will learn to adjust and carve out more time for myself to write, beyond just moments. And one day, I will have more than five minutes to myself in the bathroom. Lina Lau is an emerging writer of creative non-fiction in Toronto, Canada. According to the ‘About The Author’ section from her first book, written at age 6, ‘Lina likes to skip, work, do cut and paste, help her teacher and read a book.’ She now prefers to bike instead of skip, and she rarely does crafts involving cut and paste. But she continues to enjoy reading, and also writing. Her work can be seen in Skirt Quarterly, and online on The New Quarterly and Invisible Publishing websites. Writing has always been a part of me. As a kid, I scribbled stories and fairy tales in my purple coil-bound notebook. I wrote for pure pleasure, compelled to do so. I don’t know if immigrant parents ever encourage their children to pursue a career in the arts. Mine did not. My mom thought it was fine I wrote stories, but never thought it was a realistic career choice. My family and I immigrated to Canada when I was three, in the early eighties, after my parents re-built their lives in Saigon after the American War in Vietnam. My dad dreamed of much more for his two daughters than he ever had. Sadly, after a few years in Canada, he passed away sixteen days before he could realize his dream of becoming a Canadian citizen. My mom became a single mother raising two children in a country not her own. Educated as a teacher in the land of my ancestors, she operated a sewing machine for years and years to provide for us. Growing up in Winnipeg’s West End, the neighbourhood was diverse and vibrant, yet I was aware of cop cars cruising the streets, and mindful as I waited at a bus stop where a girl had been jumped and assaulted. I don’t believe I lacked anything growing up. We just never had money for anything more than the basics. In high school, I attended the International Baccalaureate program at a high school outside my neighbourhood, where the average income far exceeded that of my neighbourhood. In grade ten, I was excited for the American History class trip to Boston. “Will mom let me go? It’s educational.” I asked my older sister. “With what money?” She pointed out. I never asked my mom. My dream was to major in English and Religion in university. Go on to pursue an MFA. Instead, I got my Bachelor of Commerce degree, and got a steady job in the Public Service of Canada right out of university. I paid my way through university with scholarship money, part-time work, and my sister supplemented the rest. Both of my mom’s wrists required surgery due to repetitive strain injury. Her hands were red and raw in the winter. Her mind was cluttered with worries for me and my sister. I needed a practical degree and a steady income to be able to contribute financially to the family. I needed to buy a house with my sister in the suburbs for our mom. I needed to attempt to repay what my mom had given to me, what she had given up for me. So I made a choice. I turned away from writing, and set aside those dreams. I sealed away that part of myself. I believed at that time that I couldn’t have it all – writing and my day career. Writing was an indulgence we could not afford. Fast forward almost twenty years after high school and I am thankful for my life. I have a supportive husband, two kids, and working full-time at a steady day career. A full life. An immigrant parents’ dream. Did my dad peer from beyond the land of the living, proud that I had “made it”? About a year and a half ago, I looked over the edge of the rest of my life. I felt like I was skipping along the surface. Disconnected. A mother. A wife. A daughter. A worker. But where was I in all of it? I felt I had space to breathe again with the kids no longer in diapers and needing my constant attention. I gave myself permission to become the star of my own life again. No mom guilt. “What now?” I asked. Did I want to focus on my day career, to work my way up the corporate ladder? Did I want to learn how to become a better cook? Did I want to concentrate on my running, to train for more half-marathons after running my first one? Not really. Deep within, I knew what called to my spirit. I had taken online writing courses throughout the years, through Athabasca, through Humber College, and a Mentorship Program through the Manitoba Writers’ Guild. Just a taste to soothe my spirit and keep me going for the next little while. Starts and stops, a submission here and there, contests entries, bits and pieces of creative non-fiction essays. Last year, I took another online course: How to Write Your Non-Fiction Book at UBC. It lit a fire under me. I was excited AND I was terrified. Was I really going to commit to this – to make writing a priority? As a dream, as a fantasy, it was glittery possibility, a mirage always in the distance. To make it a goal was to risk failure, risk disappointment, be exposed and let people read my soul. To do the hard work, day after day. To challenge myself to do this thing I said I always loved. To take a risk and call myself a writer. I joined Twitter last year and began to immerse myself in the realm of CanLit, inspired daily by thoughtful and insightful authors. I started a blog and started writing about how spirituality manifests in my life. I’m listening to podcasts such as Can’t Lit and Lit Mag Love while on the bus to work. I’m searching for submission opportunities while on the bus. I’m on the outside looking in, seeking to build a writing community, a little bit at a time. With a full-time job and a busy family life, I’m committed to writing regularly, snatching time from other areas of my life. Stealing moments of time dropping off my daughter at a birthday party and writing in a coffee shop around the corner, visiting the public library during lunch breaks to do research, thinking about a tricky transition in the shower. Late night writing and editing when the kids are in bed, lunches made, and the house tidy (enough). When my brain hurts, peppermint tea and Doritos sustain me, before getting up to go to work the next day. Snatching time whenever I could. And grateful for that time. Doing what I have to do and feeling blessed to be able to do what I love. Last October, I published my first piece in the Same literary journal and their annual anthology, the piece nominated for the Pushcart Prize. Last month, I published my second piece in Prairie Fire Magazine. And I was blessed to read an excerpt at their 40th anniversary issue launch party. It was a magical experience. My extended family took pictures and asked me for my autograph. My mom and sister were there, beaming, proud – it meant the world to me to share that moment with them. At age thirty-six, I published my first paid publication. Not a great milestone to some who have achieved far greater at a far younger age. Yet for me, it is a powerful and meaningful achievement. Because it took me so long to get here, I appreciate the journey that much more. I integrate writing into my life now. If I hold on too tight – too much writing and I neglect my health or am not present with my kids or take my husband for granted. If my grip is too loose – too little writing and I miss it, I am cranky with my kids and do not feel like me, losing myself to all my other roles, not honouring myself. I strive every day to achieving the right balance. I fail. I keep trying. A Hindu proverb states “There are hundreds of paths up the mountain, all leading in the same direction. So it doesn’t matter which path you take.” I’ve learned that all writers have different journeys and different timelines. I’ve learned it’s never too late to do what you love. You can only deny your truth for so long. You leak your truth. It bubbles up. It breaks through when it can no longer be denied. I am forever grateful to—and inspired by—authors who lead the way and do the heavy lifting, who hold space for writers from marginalized communities, so I may have a path to walk. As I work toward the day writing may turn into my day career, I’m closer to becoming the person I want to be. I now embrace the writer in me and pursue it as my true life’s journey. 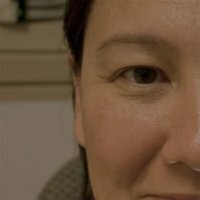 Linda Trinh writes non-fiction and fiction and lives in Winnipeg, Manitoba. Through her writing, she is exploring spirituality through the lens of her Vietnamese heritage, Buddhist upbringing, love of world mythologies, and travel to sacred spaces around the globe. Her work has appeared in Prairie Fire Magazine and the Same literary journal. She is currently working on her first book, a work of creative non-fiction. Linda may be found online at lindatrinhblog.wordpress.com and on Twitter @LindaYTrinh. "Understanding yourself requires, so often, reflective surfaces. Mirrors, rivers, phone screens, puddles on tarmac - to be, one needs to be seen. "—Terrence Abrahams. Understanding yourself requires, so often, reflective surfaces. Mirrors, rivers, phone screens, puddles on tarmac - to be, one needs to be seen. Harder still is to be when what you are is physically unseen, a mental image only you are privy to, locked in the mind’s eye.For the first eighteen years of my life, I avoided mirrors. Now, since my life and my body are a little different, I no longer have to avoid my reflection. However, I must, and still often do, find myself detached, my world - and myself - placed slightly to the left. Detachment is often necessary for survival. Removing the self from a situation that can cause harm to the body or spirit, physically or emotionally, is a common part of many people’s lives. Whether it be taking a cab home at night or leaving a movie theatre when a film gets a little too graphic, detachment protects and prevents. However, detaching from art has, and always will be, painful for me. Often, though, it is necessary. I’m talking in particular about representations of trans people in art - whether visual, like film or photography, or text-based, such as prose or poetry. At best, their representation is stereotypical and tired; at worst, entirely transphobic. I won’t deign to name the dozens of works that have insulted and further harmed trans people - especially black trans people and trans women of colour - over the past two, three, four decades. I don’t want to dwell on the failures of cisgender white people. I’m here to talk about how much I love trans poets, and how successful and necessary they are and always will be. The work of trans poets like Ari Banias, jayy dodd, Jos Charles, Cameron Awkward-Rich, Chase Berggrun, J. Jennifer Espinoza, Yves Olade, Milo Gallagher, Kai Cheng Thom, and Hannah Rego (among a dozen others) offers me much solace. Theirs is the work that I would have benefitted from years ago: work that deals not only with gender and trans identity, but self-expression, trauma, family, love, and even the details of daily life. However, since most of the poets listed above are based in the United States, they seem so close, and yet are still so far: I can’t easily meet any of them in person at any readings or talks they attend. Though I can’t forge a physical community, I remain grateful for my privileged access to an online biosphere, of sorts, where I can see myself and other trans poets like me live and grow and thrive. However, simply knowing they exist and are writing against the attempts at damming trans voices in writing is often enough for me. The flow may be blocked or forcibly diverged, polluted or otherwise tainted in one way or another, but it will never stop, and for that I am immensely grateful. Since the need to see a reflection of myself in literature is strong, stronger only now that there are blatant efforts to prevent, police, misrepresent, and/or remove trans people from their own ways of storytelling. I write poems for, first and foremost, myself - I bring into existence the poems that I did not see when I was younger and needed them most. Sharing them, however, makes it less about me and more about what I am to other people: a trans person whose work adds to the ever-growing list of trans poets writing today, whose existence and effort could and hopefully will inspire a young trans person to write against the dam and damning they might be up facing. That, of course, is how I got here, writing this for you today. Terrence Abrahams lives and writes quietly in Toronto. His work has been a part of Hobart, Peach Mag, the Puritan, and many gendered mothers, among others. He hopes you’re having a good day. I feel very fortunate to have been the result, it would seem, of my mother’s damned stubbornness and my father’s farm work-ethic. I mean, I’ve published over thirty trade books of poetry, fiction and non-fiction since 1998, and well over one hundred poetry chapbooks since 1992 (that’s a lot, right?). And yet, some of my earliest writing possibilities came from established writers who might not have known exactly what my teenaged or early twentysomething self might have been attempting, but enough to pass along that most important of directives: This is important. This is worth doing. Keep going. For a kid barely published, even at the time it felt like an incredible wealth of support: the arrival of a postcard from George Bowering when I was twenty-two, or a signed copy of one of John Newlove’s poetry books when I was twenty-four, that I’d mentioned to him in a note (along with a stack of chapbooks furtively deposited in his mailbox) I had been reading and enjoying from the library. Ken Norris sent typed letters, Don McKay mailed handwritten notes on small cards, and Judith Fitzgerald sent notes on the back of the cover of her latest book, utilized as a large-format postcard. George Elliott Clarke always included (and still does) a new poem with his letters, handwritten in his distinctive, enthusiastic swirl. By the time I was twenty-six, David McFadden met me at a restaurant on Toronto’s Church Street, and suggested we order the pancakes, which were awful. “I know,” he said, almost gleefully. While I was desperate at the time for editorial feedback, these moments of encouragement, of acknowledgement, were deeply important, and incredibly generous, and fed the machine that pushed me further to write, read and simply explore. One might suggest that I consider my biggest prompts to have come from the outside, fully aware how this would dismiss my eagerness and willingness to simply “take the ball and run.” The past twenty years have included prompts from review copies received in the mail, something I might read online, or even sitting through a really good reading. Just as often, the social engagements with friends, many of whom are also writers, are enough to provide energy. Back when I used to tour heavily—some two to five months wandering across Canada with a box of chapbooks for the sake of poetry readings—I would return home renewed, and be able to continue in solitude for another six months, before heading out once more. Writing prompts writing; activity prompts further activity. The best response to a poem is another poem, someone said. Attributed and reattributed, repeated ad nauseam. There’s nothing finer than encountering a piece of writing that makes you stop in your tracks, something that might prompt both admiration and envy, but also the impulse to want to try that out as well. There is nothing wrong with influence, and writing comes from practice as much as attempting as many ideas and tools that cross our paths as might be possible. "I have wanted to be a writer my entire life, but strayed off path so many times. I almost didn’t make it this time, but I did, because there were people who reached out and showed me the way. "—Isabella Wang. Writing has never been natural for me. I immigrated with my mother to Canada at the age of seven, not knowing a single word of English. I struggled with it all throughout my childhood, and I still struggle with it now. When I was eight, my parents took me to get our passports renewed at the Canada Place Building in Downtown, Vancouver. The officer from behind the counter came up to me, got down on his knees, and looked me in the eye. He asked me what I wanted to be when I grew up. Without thinking, I blurted out, “Writer!” It made sense then, but as time went on, the likelihood of me ever making it as a writer grew increasingly unlikely. It was in my grade three class that I fell in love with writing. We poured our imagination onto the pages of colour-coded notebooks, filling them with our stories. We turned these stories into books that we bound and illustrated ourselves. Every afternoon, everyone would gather around the carpet and students would read their stories aloud to the class. My teacher wrote “voracious reader” on my term-end report card. Neither my mother nor I knew what it meant, so we looked up the definition together. At home, my mother taught me English by reading the Magic Tree House, Geronimo Stilton, and Boxcar Children series with me. At school, these chapter books were considered too advanced for me by my teachers, so I was forbidden to check them out from the school’s library. I tried to imitate these stories with my own, but the stories I wrote only made sense in my own mind. When I read my first illustrated storybook in front of the class, with fragmented ideas that leapt from fire-breathing dragons, to gardening, to ordering pizzas at Pizza Hut, everyone laughed and the teasing continued into recess and lunch hours, on playgrounds and in fields. I was given nicknames. My classmates mocked the way I spoke, made faces as they hurled cultural slurs at me, mimicking my heavy accent that I grew to detest. When I handed in a writing assignment, my grade four teacher read it, and told me that I shouldn’t be writing at a grade four level in her class, or have been allowed out of ESL. It was humiliating. It made me never want to write anything ever again. For many years, I didn’t. My stories ceased. I kept up journalling until one morning in grade five, I scrutinized my face in the mirror and realized that I would never be accepted as a writer in Canada because I was Chinese. I shredded all 256 journal entries and flushed them down the toilet. A short while later, I stopped speaking. No one heard me speak for two years, though at home, crouched on the window ledge from behind the curtains in secret, I read books aloud. I practiced enunciating individual words, articulating every syllable, stressing every vowel, reciting the same sentences over and over again until they no longer felt slippery on my tongue. In silence, I listened to others speak, listened to the variation in their voices, listened to the crescendoing and falling of words like notes on sheets of music, phrases like chords. My mother tried beating the words out of me. She thought that if she used enough force, fear would override humiliation. But nobody wanted to hear what I had to say. It was by keeping silent that I learned English. Silence suffocated the Chinese in me, my first language. My mother too, gave up. No immigrant parent having come from the suburbs of Eastern China and undergone a lifetime of poverty and hardship, would give their only child up to the arts. My parents sacrificed time and their sense of belonging to bring me to Canada because the land offered more chances, and more possibilities for me to grow into someone more rich, prominent, and successful than themselves. In the end, I always knew that my parents would never allow me to pursue the arts. Still, I persisted. Going into grade eleven, I was preparing to do my SATs, and in the process of applying for med school at Stanford, UC Berkley, Amherst, and Harvard. My academic load for the year stacked up to 12 in-school and online courses. My parents had forced me to enrol in every science and math course. Out of stubbornness, and in an act of rebellion, I also took European history, American history, English, literature, and writing—every single other course that actually interested me. Yet something felt missing. I wanted more— a community in which I could immerse myself, with people who were as passionate about books and writing as I was, and places where I could go to attend workshops and events. That something was exactly what I found when I ventured into the literary community. It was a dream, and I still think I’m dreaming. But back then, not knowing if any of this even existed, I almost gave up searching. The day I submitted a mix of essays, stories, and poetry to different youth contests and journals, was not any particular day. I had no experience. I did not know what literary journals were beyond The New Yorker and National Geographic or Time, nor did I know what creative non-fiction was when I submitted a personal essay to The New Quarterly. By the time I found out that I had been longlisted for The New Quarterly’s Edna Staebler Essay Contest, I had forgotten all about the essay. I didn’t open the email for two days, thinking it was a rejection, and when I did, I had to look up what a longlist was. What TNQ did was open up a door for me. I thought a publication would save me; validate me as a writer to my family. Turned out, it didn’t. When I told my parents that my work was going to be published, they asked me, “Why are you submitting to magazines? We live in a technological world now. Magazines and books will be outdated soon.” It hurt. But it made me realize that if I wanted to be a writer, I would have to fight for it myself. I changed my application from sciences to English overnight, thinking, That isn’t who I am. And because I was only 15 when I wrote some parts of the essay, the essay had flaws which would appear amateurish to any seasoned editor. What’s so great about TNQ and other journals out there, is that they do recognize potential from young and emerging writers, and they support that. TNQ took my age into consideration and were willing to mentor me. My editor, mentor, and friend, Susan Scott, took me under her wing. She introduced me to the world of publishing for the first time, guiding me along, and offering kind words of encouragement, and we grew from there. I had other mentors too. I paid for SFU’s Continuing Studies creative writing programs with my lunch money, and attended them while telling my parents that they were science conventions. In my fiction workshop, I learned about planning, outlining, and structuring from Jen Sookfong Lee. It was in my poetry workshop that I learned to edit my work for the first time, from Evelyn Lau, while Fiona Tinwei Lam taught me about form. One of the most important lessons I’ve learned since coming to writing, of perseverance, came from Rob Taylor, who showed the class his hefty spreadsheet of over 1300 rejections. Afterwards, I went on a submission rampage and sent out 40 poems to various journals and online publishing sites overnight, all of which were rejected. But he taught me not to give up, and had he not shown me the way, I would have wanted to quit and trash everything. Over time, I learned to value rejections as much as I do, time, and the writing process itself. The cycle is endless. You go back and make improvements, get rejected, go back and make improvements, and get rejected again. In doing so however, you start to realize that by returning to old work, figuring out their weaknesses and mistakes, you yourself have progressed, and there is nothing more rewarding than that. One of the most useful pieces of advice I have ever received, came from a 500-word rejection letter, in which the editor transferred what her mentor Hiromi Goto had taught her, about centring a piece of writing, on to me. My story starts out the way many other writers’ stories start out. Had I not plunged into the unknown, thinking I didn’t have anything left to lose, I don’t know how long it would be before I went back to writing again. I’m not the only one. There are so many talented, young writers out there, who are as full of passion as they are full of powerful stories to tell; who would love to be part of this community, but do not know how to start or where to look. It’s scary to throw yourself out there, not knowing how you will be perceived, whether people will view you as imposing or ostentatious for harbouring ambitions, and whether or not you will be accepted. Coming from a background of being constantly reminded that I didn’t know my place as a Chinese girl growing up in a Western society, and being told that my ideas were stupid, I grew up believing that my voice wasn’t wanted. Which is why what surprised me the most when I made the transition to writing, is that people are actually nice. Like just genuinely nice. People didn’t shoo me away when I approached them to say hi. Nobody has ever appreciated my writing before. I offered myself, as it is, and for the first time in my life, that was enough. My biggest piece of advice for young writers is to get involved. Go to events, volunteer, meet people, and reach out. When you see writers at readings and on panels, introduce yourself, ask them questions, and they will remember you. Often times, these same writers will be at readings that offer open mic opportunities. It’s a chance to be seen. If you read your work, they might approach you themselves, and if you tell them about the time you were at their event or had read their work, a conversation will grow. From it, you will have formed a lasting connection. There are so many people who truly want to support you and help you thrive, if they see that you are eager and want to learn bad enough. For those with financial setbacks, know that you do not need a university education or MFA degree in order to write. There are other ways to learn, and opportunities are everywhere if you are willing to look for them. My entire writing experience blossomed out of a high school education and the three creative writing workshops I took at SFU, and I was only able to take those classes because I didn’t eat lunch for six years. I landed my first two jobs by volunteering at festivals, and by going to every event and open mic I could find. I am learning by reading other people’s work, by reading widely, and by listening to free podcasts where writers and editors share their own experiences and advice. Like many, I am not financially privileged to pay for classes regularly, which is why I’m constantly submitting work out there, hoping to get a chance to work with an editor and get feedback for my work that way. I have wanted to be a writer my entire life, but strayed off path so many times. I almost didn’t make it this time, but I did, because there were people who reached out and showed me the way. Mentorship is very much needed when one is just starting out, and it shouldn’t be available only to those who have the money to pay. One shouldn’t have to stumble upon it by pure luck, the way so many other marginalized writers and I have done so in the past. So the question I’m asking myself now, is what can I do to help young writers like me? To create a safe space that not only helps to amplify and bring out their voices, but offer long-term support and mentorship in ways that are sustainable, nurturing, inclusive, and accessible. Believe me, I am working on it. At age 5, I made a decision. I knew then, what I know now; when it came to writing, I had to do it my own way. I often wonder how this outlook of mine even came to fruition –— how did it evolve? My upbringing certainly didn’t outright discourage creative outlets or outputs, but it always came down to: how can you make a living out of it? And so, I wrote fantastical short stories constantly throughout my childhood between poring through books. I read about Br’er rabbit, the Pevensie children, and Grace Willingdon. Reading Amazing Grace was where I learned we black girls could do anything. My parents couldn’t afford to (though perhaps more realistically, justify) send me to the writing camps I so desperately wanted to go to. Not a criticism of them, but a fact. Still, this disappointment — this reality — made me scrappy. I continued to read and write and once I hit high school, I discovered my second love, theatre. No, I didn’t see all that many plays, but something about theatre, or rather, playwriting, opened up a world of possibilities. There were other opportunities outside of fiction. I was a young black teen going to school in the suburbs and so possibility and opportunity were important. I’m still not a playwright, and haven’t written plays in years, but it taught me I could write anything if I wanted to. Still, I was still looking for what I wanted before: some sort of formal education, proof that I was a real writer. So, one day, many years after I made this major decision, I did the opposite of what 5-year old me would do, and I signed up for Humber College’s Creative Writing by Correspondence Program. I finally realized, I couldn’t do this on my own. There’s so many things no one told me about writing a book. For starters, it’s actually lonely as hell. No one will tell you that it’s okay to not want to write any of your book at all. A story may chase you. Confront you. Even scream at you. But, you don’t have to listen. Not until you’re ready. Even if you’re on a deadline. Sometimes, you’ll cry. Sometimes, you’ll quit and it’s usually temporary. Some people quit permanently. And that’s okay. Maybe that story wasn’t ready to be told. No one tells you that your first draft or drafts won’t be perfect. They may even be terrible. They might be disjointed. They may have no plot at all. They may have too much plot. Your characters may not be developed. You might not know how to keep your voice and tone consistent. People will suggest great books and helpful resources but their contents may not stick with you. It may take you a long time to learn. And that’s okay, too. You’ll want to prove them wrong. Nailah King is a Toronto-based writer and her work focuses on social justice and explores racism, discrimination, identity and her Caribbean heritage. To read more of Nailah’s work, visit www.wordandcolour.com. Where is this place? What happened? you will see me flying. I don't want to forget I say. ShihShin Lee is a Taiwan born half Korean who has lived in China for over 20 years. In 2009, she got her degree in Journalism and communications and made her way to Vancouver. With her mixed culture and queer identify, she has been writing poetry in Chinese since she was a teenager. Her writing is all about recovering from trauma and finding "one" self. Her biggest dream is to help those in need heal through her journey. I've always loved sharing ideas, teaching, and talking about new ways to write stories, so launching my own writing program was only a natural next step. Aside from placing a strong emphasis on creation, I also want to establish a community of like-minded writers, while making sure I create resources and support for marginalized folks. In 2013 I learned something very shocking about myself. I learned that I was quite good at helping others with their writing. It's weird, you'd think I'd be able to see the same flaws, room for improvement, or places for polishing in my own work with such ease, but really it's not the same thing. Being on the outside looking in is always easier. My goal for this project is to essentially have a collection of various experiences (from both emerging writers and established writers). What I hope this will do is create an awareness about some of the struggles we face, while also focussing on how the small successes can change our lives. Folks will learn how to be better allies, how to ensure that marginalized writers are seen, heard, and allowed the space to say what we have to say. It's gotta start somewhere. With this new blog I want to do more. I want to give other writers a chance to share their stories about anything writing and publishing. How did something you read affect you? How did finally seeing yourself represented in a book, story, article, poem, or panel change you? These stories can be about anything. I am doing a "trial run" of these guest post over the course of summer 2018. Interested? Send me an idea. All writers will be paid and recognized for their work. Marginalized writers are very much encouraged to get in touch.